Gloriously played out, Sa Re Ga Ma Pa is an ultimate Tamil Singing Reality Show has reached its Grand Finale which is going to happen at Jawaharlal Nehru Stadium on 14th April 2018, Saturday. It will be aired live on Zee Tamil and Zee Tamil Live. Launched in October 2017 the show has done rounds among the Tamil audience around the world, occupied a big part of their hearts and ranked heavy among the TRP Charts. It was aired every Saturday and Sunday. Three judges Vijay Prakash (Film Composer), Karthik (playback singer) and Srinivas (playback singer) have judged the episodes. The final will be judged by 14 jury members alongside these three. Sa Re Ga Ma Pa 2018 has become popular as soon as it hit the screens on the first day. After a series of amazingly Competitive episodes, the Grand Finale is now a battle between the top finalists Varsha, Srinidhi, Sanjay, Jaskaran Singh, and Ramani Ammal. The five finalists have made an amazing entry into the show and lasted this long with their mind-blowing performances. The show has achieved a popularity higher than its predecessors because of the finalist Ramani Ammal who is a 63-year-old musical artist competing with younger peers. The woman has been an inspiration to many of the young Tamilians and has a special place in the heart of every Tamil audience who watch the show. 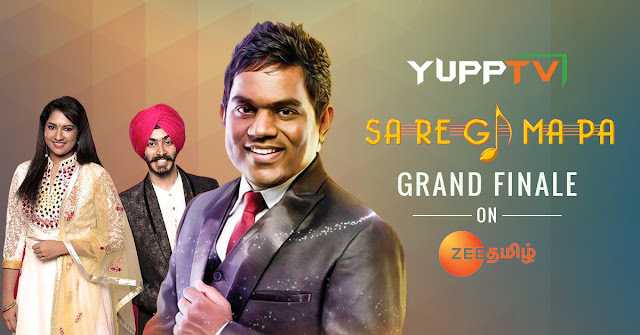 Watch the Sa Re Ga Ma Pa Grand Finale that is going to be aired on Zee Tamil on 14th April, Saturday. The overseas audience can Watch it on Zee Tamil Live on YuppTV through your Smart Television, Smartphone or any other internet enabled device.